Sometimes you need machines to speed the work. Maybe there's an urgent need due to flooding, or maybe you're building a large number of sandbag (earthbag) houses. 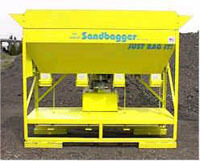 Here's a sampling of some of the sandbag filling machines currently available. - Output: Typical pace of the machines is around 500 bags per hour. Average Output per day is around 6000 bags per day. Burlap or polypro sand or gravel bags per/hour. - Operators: Two (2) operators can run more than one machine at a time. This tube filling machine fills continuous polypropylene tubing. So far it's been used for erosion control, but it could be utilized to mass produce affordable housing. Steve Villa and Steve Williams, the owners of Superior Sandbag Systems, invented the process and received a US patent in 2000. 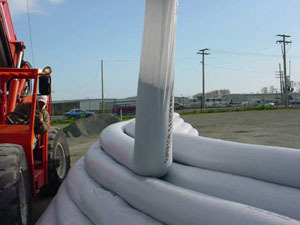 Sandbag material is available in 6,000-lineal-foot rolls. 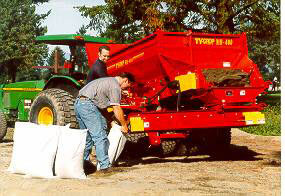 The Superior Sandbagging hopper can fill 240 feet of bag at a time without stopping. A two-person crew can fill and place 240 feet of tubing in 90 seconds. They have a mobile sandbag machine that can come out to your jobsite or yard and make the sandbags right there. They offer machine rental, sale of sandbags- empty or filled, delivery of sandbags, if needed, and prompt and courteous service. Their sandbags are available in different colors and sizes. They can fill bags with your desired content -- sand, pea gravel, etc. This company offers the widest range of bag filling machines I've found so far. Machines are available for sale or hire. Power requirements: 240 volts, single phase, 10 amp rating. Trailer Rating: The dual axle trailer is rated for moving with full load. It is however recommended the unit to be emptied before relocation. They offer single and double hopper models. 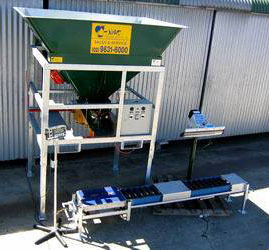 The single hopper shown below uses a foot pedal activated heat sealer to close bags and roller conveyor. Automatic control - set the electric timer, depress the foot pedal control and feeder will cut out at the selected time. It will not operate until the pedal is depressed again. 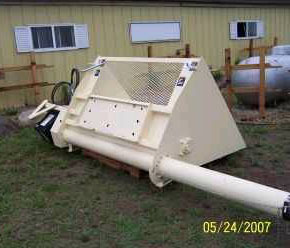 Use the MH-400 with Cross Conveyor to quickly and effectively fill sand bags. With her machine, Malone says she could fill a bag every 2 to 10 seconds. 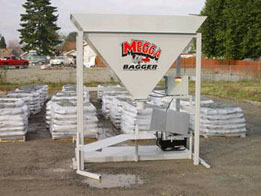 The Megga Bagger allows you to fill sandbags faster with fewer personnel. This saves time and labor! Megga Baggers are self contained and portable. All products are Underwriter Laboratories (UL) approved. Ergonomics play an important role in the design and construction of the Megga Bagger. Flat faced hoppers coupled with adjustable slide tables significantly reduce back strain and fatigue, thus reducing the chance of injury and increasing production. Festo Pneumatics, Honda generators and adjustable Martin Engineering Vibrators are examples of components that come standard with your automated Megga Bagger. The Sand Master by barriersystemsllc.com for skid steers, backhoes, loaders and excavators can efficiently fill, securely close, deliver and stack up to 26 sandbags at a time. The equipment is designed to fit many different models of machines. It is capabable of filling as many as 6,240 bags in an 8-hour period. 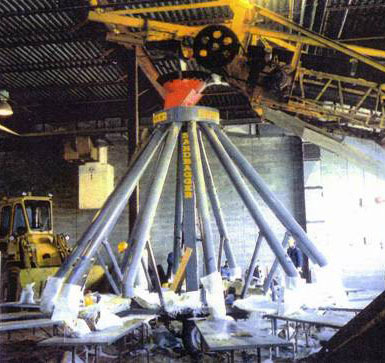 What separates the SandMaster from most other sandbag filling machines is that they only replace the shovel, and most materials, wet or dry, can be used with the SandMaster in the event sand is unavailable. We have designed and brought to market three new products. 1. 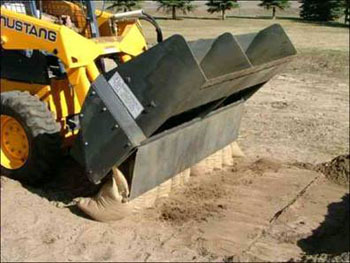 ProBagger: The design of this unique skid-steer attachment allows the operator to fill twelve (12) 14" x 26" poly or burlap sandbags at the same time. Simply attach the bags, scoop the sand, or other material, tilt the bucket back up which fills all twelve bags; drive to your desired location, tilt the bucket and release the hydraulics. Your bags are left standing and all that is left is to tie the bags and place them in position. Any material that can flow into a bag can be filled faster and with more ease using the Pro Bagger®. 2. Quik Levee Builder: This unique machine will build a three and a half foot high levee, 200 feet long in approximately 90 minutes replacing about 10,000 sandbags. (It makes one large, long bag.) 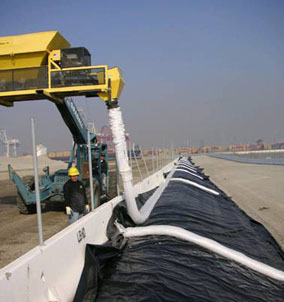 The Quik Levee Builder® is capable of building levees for floods, chemical containment and spills, storing salt, sand, gravel, soils, grains, etc. Millions of dollars of property can be protected in a short amount of time and using much less labor than conventional methods. Beach erosion, wind and sand erosion, heavy surf abatement are some of the other problems that the Quik Levee Builder® can be employed to protect landscaped property and buildings. 3. The Instee Levee Builder® is a skid steer attachment that can build an 18" barrier, 400' long in approximately 1 hour. This machine was designed to be filled with clean fill dirt which is less expensive then sand. Like the Quik Levee Builder®, this smaller machine can save millions of dollars of property in a short amount of time and using less labor than conventional methods. The Instee Levee Builder® can also be employed to protect landscaped property and buildings. The Sandbagger is a low cost, safe, transportable, fast and efficient sandbag filling machine capable of very high production. It can be set up on site in minutes and then moved as quickly to another priority area. 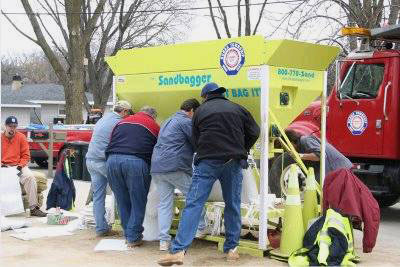 The Sandbagger can produce over 5000 filled sandbags per hour in a sand pit or in a large building during inclement weather, and the sandbags can then be transported to flood areas as required. The Sandbagger is driven by an efficient 1/3 HP electric motor. 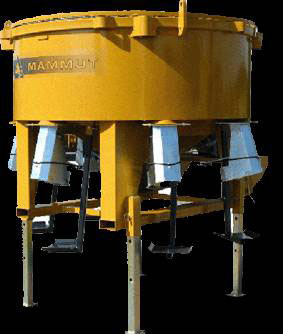 The Sandboy is a volume batching apparatus for one tandem-bag or 2 single bags at a time. - It is ideal for manual charging or by means of a truck-mixer. 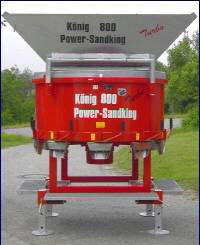 - Filling performance: With dry sorts of sand up to 300 tandem-bags per hour or 1000 single bags per hour are possible. - Easy operation with a rapping gear (moved by manual vibration). - No external energy necessary. Using two feeders, two people are able to take up to 750 bags of sand in the weight of 25 kg each in the time of 1 hour. Every bag is filled with the equal amount of sand which ranges from 20 to 40 kg.. The required weight can be manually set at the beginning or changed during the operation. The same weight of sand is a great facilitation for carriers. A convenient and practical fastener enables a quick and painless closing of sandbag. Weight without sand: 400 kg. It is available with a belt conveyor. Using just 1 machine operator (instead of 24 laborers), Mr. SandmanT fills, seals, and discharges over 1,000 sandbags per hour. 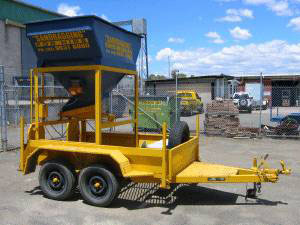 This sand bagging machine can be towed to any site behind a standard pickup truck. It makes and fills sandbags, dropping them off the rear conveyor, replacing dozens of workers manually filling and carrying bags to where they are needed. Currently seeking licensing partners. Mr. SandmanT cuts polypropylene bags from a roll and fills each one with about 50 lbs. of sand, seals, and discharges finished bags to the rear. There are two independent filling stations, allowing one side to run continuously while replacing bag rolls on the other side. The machine is mounted on a heavy-duty trailer, so it can be towed while operating-dropping bags where they are needed most. 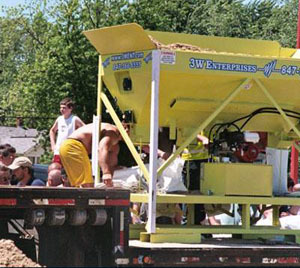 A sandbagging manufacturing apparatus designed to be used with standard sanding trucks normally used with a broadcast spreader. 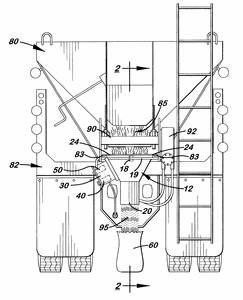 The truck includes a large hopper with a hydraulically controlled conveyor belt located longitudinally inside the large hopper that delivers sand to a rear opening. Located below the rear opening is rigid framework used to hold the broadcast spreader. The apparatus includes a small hopper selectively attached to the framework below the hopper's rear opening. 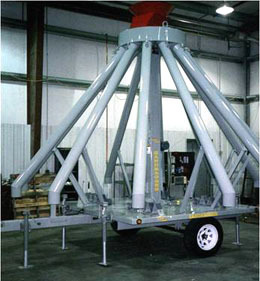 The small hopper is designed to slide into brackets formed on the framework so that the small hopper and broadcast spreader may be easily exchanged. 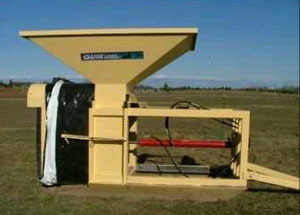 A vertically aligned chute is attached to the small hopper through which sand falls to fill sandbags. The apparatus also includes a control box designed to control the operation of the conveyor belt. Located in the control box is an adjustable electric timer that controls the length of time the conveyor belt is activated which, in turn, controls the amount of sand delivered to the hopper's rear opening area. A main on-off switch is provided on the outside surface of the control box, which controls activation of the conveyor belt and the timer. 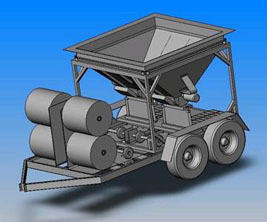 A sand bagger adapted for association with the rear end of the rearwardly tiltable body of a dump truck for receiving loose sand or soil from said body and including a power vibrated hopper equipped with an auger for uniformly distributing sand transversely in the hopper, the latter having multiple manually controlled gated bagging chutes for withdrawing sand from said hopper at a multiple of bagging stations.